The term granite, as it's used commercially, is a bit of a generic term. Now I'm not a geologist but I do have an understanding of the fundamental geology that goes into the dimensional stone that ends up in peoples' homes. Granite's generally accepted to be an igneous rock composed primarily of silica that's formed in the mantle of the earth as magma gets squeezed between cracks in the earth's crust. As a liquid at that point, the magma tries to rise to the surface. It cools very slowly and under very high pressure then forms what are called batholiths --essentially huge domes that lie below the surface of the earth. These large formations are exposed later through the actions of erosion and thrust faulting. Due to the high pressure under which the magma cooled, the component minerals in it (quartz, feldspar, aluminum oxide, iron oxide, etc.) can crystallize. That crystallization is what makes granite granite. 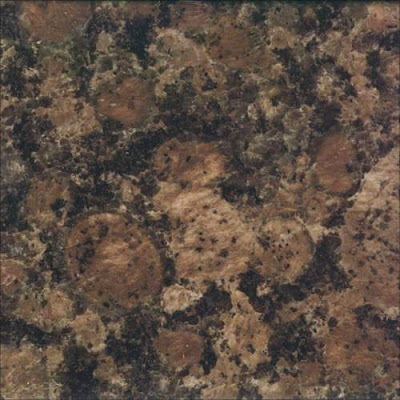 I bring that up because of this granite right here, commonly called Baltic Brown. You can see from this close up that Baltic Brown has circular crystals in it. They are in varying sizes but most of them are about two inches in diameter. Those round crystals are made from potassium feldspar and they formed about a gazillion years ago as some magma cooled underneath what is now Finland. About eight years ago I got into it with a salesperson at a granite wholesaler who claimed that those round shapes were the remains of a stand of young trees that were run over by a lava flow and got fossilized in the process. People who don't understand what they're selling are a pet peeve. Claiming to have fossils in a slab of granite goes beyond not knowing and crosses the line into the idiotic. I don't expect granite salespeople to be able to rattle off the names of the component minerals that make up what they're selling, but some basic knowledge is most definitely in order. 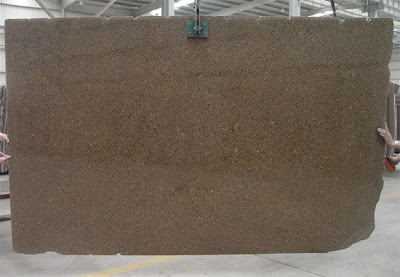 Granite that ends up as counters gets cut into slabs and polished. From the cut stone, you get a really nice cross section of the crystal structure of a particular granite. Those crystals are where granite gets its sparkle and depth. A granite that was left to its own devices as it cooled and formed over the millennia will have a pretty regular pattern and color. But when granite's actually moving as it cools, or if it runs into water, all sorts of things happen to it. A lot of times granite will run into other kinds of rock as it moves, so it will have incursions of schist and skarn and a host of other materials in it. A lot of times water will make iron oxide gravitate into cracks in the rock. Every component mineral in a granite has its own characteristics and reactions and that non-uniformity is at the root of granite's appeal. The slab below has incursions as well as lines of iron oxide in it. It's an interesting stone as a stone, but it's a lot to try to pull off in a kitchen counter. I mean, it's pretty loud. Something like that I'd like to hang on a wall to admire. It tells a really compelling story but it's not something I'd want to see in one of my kitchen projects. Patterns like that granite above are still pretty popular though that popularity has crested and is starting to wane. People are starting to look for other materials to use as counters and that's what I'll be writing about all week. Woo-hoo! But in the meantime, if you like granite then get granite. Don't believe the stories of its propensity to stain or crack or even be radioactive. Almost every negative you hear about granite is chatter generated by a competitive marketplace. I have never actually seen someone stain or crack a granite counter. Nor have I ever heard of someone who had to reseal their counters. The radon hype is yet another non-story generated by the solid surface people to prop up their decidedly inferior products. Granite is harder than just about anything it will come in contact with and it will continue to look as good as it did the day it went in for the rest of the time you have it. But let's look at some options anyhow. Tomorrow's going to be marble and the metamorphics. Thanks! Are you in the business?